To purchase PLUS, you'll need to reopen your 2018 return. 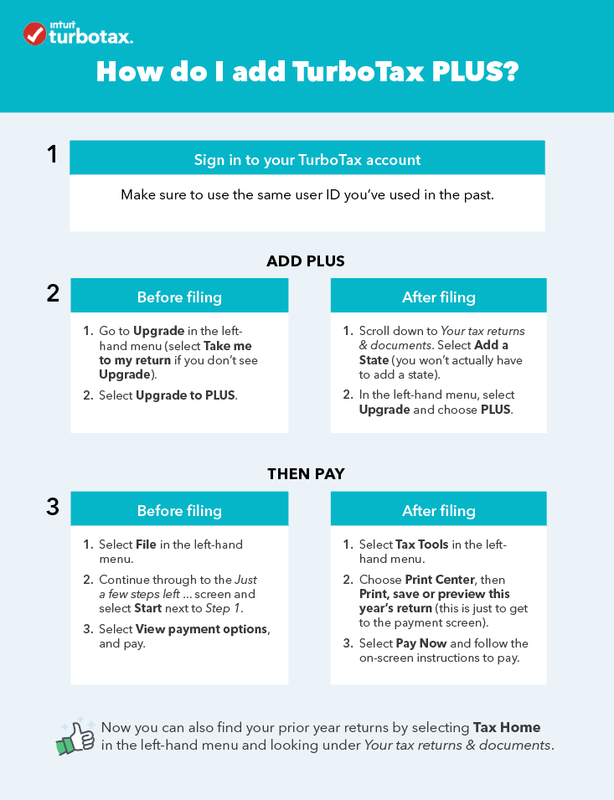 With PLUS, you can access your last seven years of TurboTax returns. If you’re on the mobile app, sign out and sign in to TurboTax (web version). Use the same login you use with the mobile app. Sign in to your account on TurboTax Online. Select Add a State (you won't actually have to add a state). Go to Upgrade in the left-hand menu. Then, go to Tax Tools in the left-hand menu. Choose Print Center, then Print, save or preview this year's return (this is just to get you access even if you want your prior year return). Follow the onscreen instructions to pay. After you're done paying, select Tax Home and find your prior year return under Your tax returns & documents (select Show if you need to).